The White House called a demand that foreign airlines not refer to Taiwan as a country "Orwellian nonsense." Flags of Taiwan and U.S. are placed for a meeting between U.S. House Foreign Affairs Committee Chairman Ed Royce speaks and with Su Chia-chyuan, President of the Legislative Yuan in Taipei, Taiwan March 27, 2018. 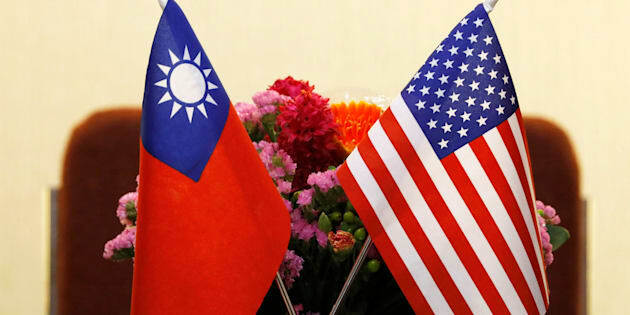 BEIJING — China has dismissed White House criticism of its "Orwellian" demand that foreign airlines not refer to self-ruled Taiwan as a country, saying companies operating in China must respect its sovereignty. "Whatever the U.S. says will never change the objective fact that there is only one China in the world and the Hong Kong, Macau and Taiwan regions are an inalienable part of China's territory," foreign ministry spokesman Geng Shuang said in a statement Sunday posted online. "Foreign enterprises operating in China should respect China's sovereignty and territorial integrity, abide by China's law and respect the national sentiment of the Chinese people," Geng said. Taiwan's independence-leaning president, Tsai Ing-wen, weighed in with a tweet, saying, "We call on all businesses to resist #China's efforts to mischaracterize #Taiwan." The government of Chinese President Xi Jinping has been increasingly assertive about its claims to Taiwan, which it has threatened to invade to bring under its control. Delta Air Lines, hotel operator Marriott, fashion brand Zara and other companies have apologized to China for referring to Taiwan, Hong Kong, and Tibet as countries on websites or promotional material. The White House on Saturday condemned China's efforts to control how U.S. airlines refer to Taiwan, Hong Kong and Macau, saying the push to make them comply with Chinese standards is "Orwellian nonsense." This is Orwellian nonsense and part of a growing trend by the Chinese Communist Party to impose its political views on American citizens and private companies. President Donald Trump will "stand up for Americans resisting efforts by the Chinese Communist Party to impose Chinese political correctness on American companies and citizens," press secretary Sarah Huckabee Sanders said in a statement. "This is Orwellian nonsense and part of a growing trend by the Chinese Communist Party to impose its political views on American citizens and private companies," Sanders said. She said the Trump administration is calling on China "to stop threatening and coercing American carriers and citizens." The harshly worded statement came as a high-level trade delegation led by Treasury Secretary Steven Mnuchin returned from negotiations in China and as Secretary of State Mike Pompeo spoke with a member of the Chinese Communist Party leadership. In their telephone conversation on Saturday, Pompeo and Politburo member Yang Jiechi "affirmed the importance of a constructive, results-oriented bilateral relationship," State Department spokeswoman Heather Nauert said in a statement. Australian carrier Qantas is among the airlines told to change how they refer to Taiwan, prompting comments from Foreign Minister Julie Bishop that any such pressure is inappropriate. "The terms that private companies choose to list destinations are a matter for them," Bishop said in comments provided by her office. "There should be no pressure from governments, whether ours or others, that threatens the ordinary operations of business." Bishop said she hoped the current understanding with China could continue and that her department would continue to liaise closely with Qantas. It wasn't clear what China had demanded Qantas do, or what the penalties for non-compliance might be. As China leverages the power of its massive domestic market to bend foreign companies to its political will, its retribution has sometimes targeted those firms' online presence. Regulators ordered Marriott to close its China-based website and app for one week after criticizing the company for referring to Tibet and Taiwan as countries in a customer survey. The moves come as China is stepping up efforts to isolate Taiwan diplomatically. The Dominican Republic switched its official recognition from Taipei to Beijing last week, leaving the island with just 19 diplomatic allies. In a further move, the ministry spokesman Geng indicated Monday that Beijing is blocking Taiwan's observer status at the United Nations' World Health Assembly for a second straight year because of Tsai's refusal to endorse the "one China principle" acknowledging Taiwan as part of China.